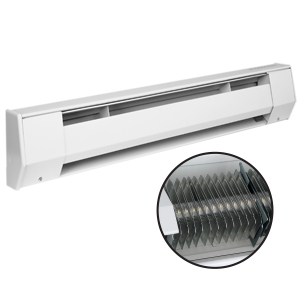 Baseboard heaters are an economical way to provide heat. They are typically used in apartment construction and other rental properties because of low initial cost and maintenance. 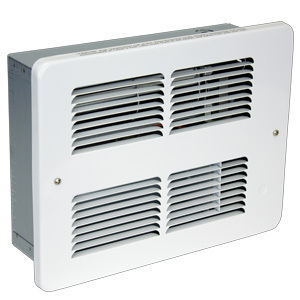 Quality components guarantee a long-lasting, reliable heater. Standard color is bright white. Almond color available. Institutional grade 18 gauge front covers and 22 gauge back cans are available for special applications. 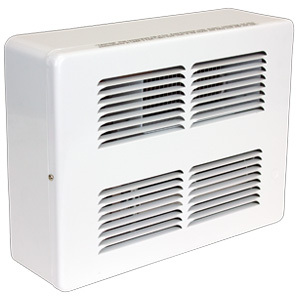 Baseboard heaters utilize convection heat to provide consistent warmth throughout the room. Offering quiet operation and rugged steel construction, making it a perfect choice for bedrooms and living areas. Designed for ease of installation and can be wired at either end. A thermostat is required and sold separately. 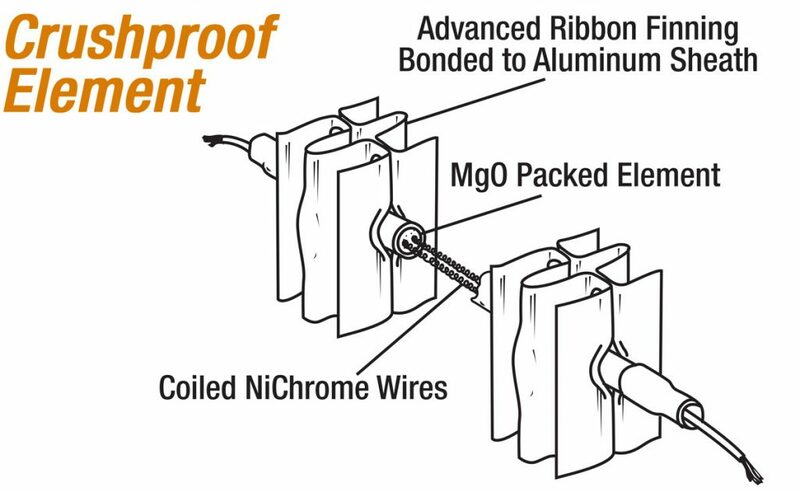 Exclusive crush-proof ribbon aluminum finning is compression welded to the heating element to provide a chimney-type flue for maximum heat transfer. The SureStop high temperature-limit feature shuts power off to the heater in an abnormal event, providing protection from overheating. * Requires BKCB1 Control box, order separately. 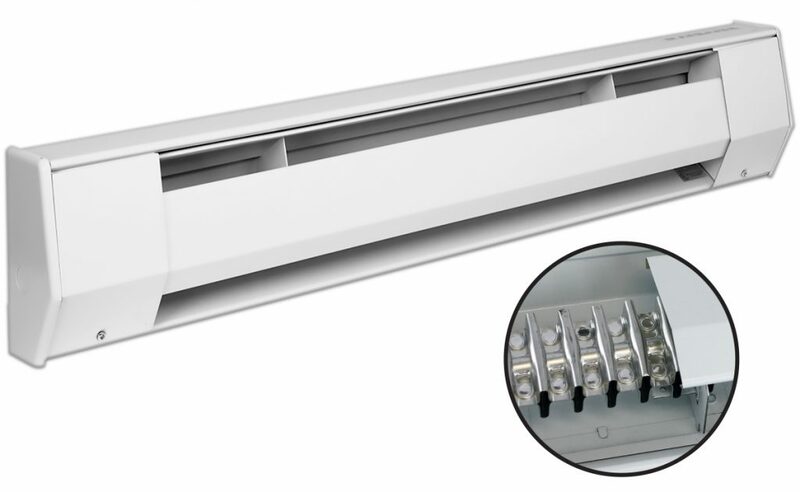 Contractor shall supply and install K Series electric convection baseboard heaters manufactured by King Electrical Mfg. Company of the wattage, voltage and length indicated on the plans. 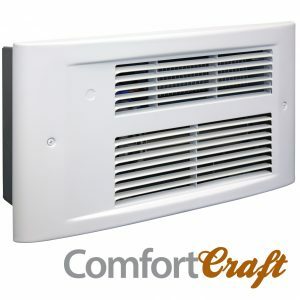 • The heater shall take room air in the bottom (lower front) and discharge it through the top front. • The heater back, bottom, and top shall be fabricated from electro-galvanized Magnesium Oxide and enclosed in a rust-resistant sheath. Ribbon 22 gauge steel. Front panels shall be fabricated from 22 gauge electro-galvanized steel, ribbed longitudinally for extra strength and have center support to resist impact loads. • The heater casing shall have modern rounded ends and corners to provide a smooth appearance, finished with a baked enamel. 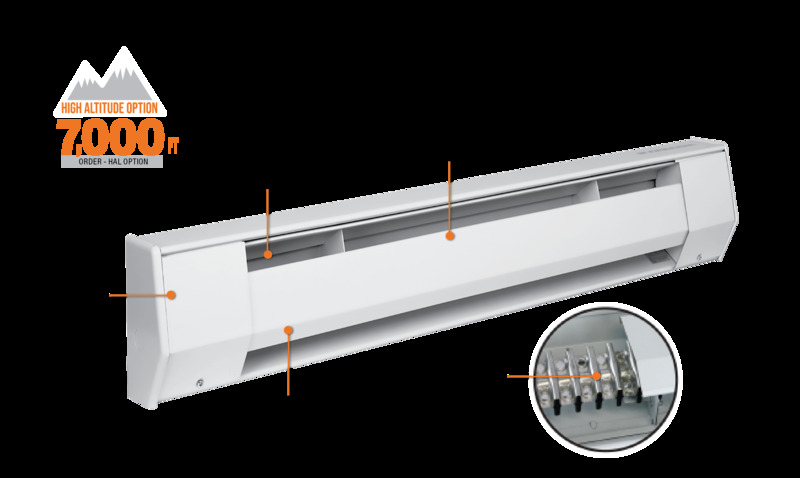 • The heater shall be provided with a continuous capillary sensor tube for thermal protection, extending the full length of the heating element, rated at 175o F, and be a fail-safe type. • The heater shall have a 44 cubic inch junction box at both ends, furnished with five 1⁄2″ knockouts located on the back, bottom, and side. • Heater elements shall consist of high quality 80% Nickel and 20% Chromium alloy corrosion-resistant wire completely surrounded by aluminum finning shall be compression welded to the sheathed element to provide chimney-type flue for heat transfer. • Heaters shall be supplied with a one year limited warranty. 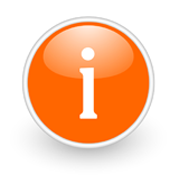 • The heaters shall be available in ratings from 375 through 1,500 Watts at 120 Volts, and 375 to 2,400 Watts at 208-240 and 277 Volts. • The heaters shall be available in 187 or 250 Watts per lineal foot. Design perfected over 50 years, is safe, durable and economical. The ceramic thermal storage core never leaks or explodes like fluid-filled baseboards.